This book falls within the Wild Adventures of Tarzan/Edgar Rice Burroughs series. The book consists of three loosely linked novellas. The links are there but very subtle. This means that they read well as a series but also as individual tales of Tarzan. That fact is IMHO brilliant! “1936: Tarzan and the Fountain of Youth” begins the book with a bang! Tarzan meets a friend for a drink at a London pub. George Fredrickson wants Tarzan to return to Africa. Fredrickson’s son Jack is out of touch, being in Africa with a Botanist named Professor Alistair Winslow. Fredrickson wants Tarzan to find Jack before it’s too late. 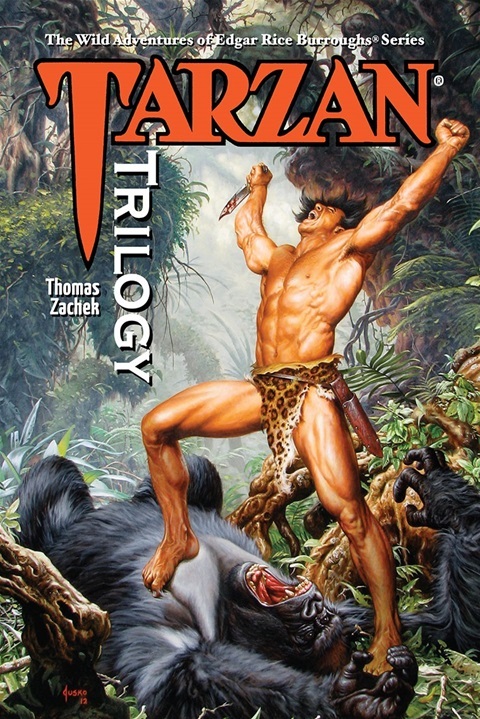 “1937: Tarzan and the Cross of Vengeance” is the story of a man named Maximilian who has a beef to pick with Tarzan. Thanks to a PI named Raymond Wilson, Maximilian now knows that Tarzan is actually John Clayton, Lord Greystoke! “1938: Tarzan the Conqueror” brings the Nazis to Tarzan’s neighborhood. Tarzan has argued in the House of Lords that the Nazis’ presence in Africa, their enslavement of native tribes, and flat out murders should be a priority for Great Britain. The other members point out that the Government is in the midst of negotiations with Germany, and is loath to anger Hitler. It is only natives, and they should fend for themselves. Tarzan is not one to stand by and let his friends be slaughtered by the Third Reich. He will go to war with the German Occupation of Africa even if he has to do it alone! All three stories could have been written by Burroughs himself! The tone, the atmosphere, the characters and relationships with the natives ring as if Thomas Zachek were channeling Burroughs’ spirit! Bravo! Well done! Encore! I give each individual story and the volume as a whole five stars plus!